If you are a regular reader at FreakGeeks, so you might have gone through the news of the new up coming tool called iOSOpenDev. It is the tool, which opens a brand-new platform for the developers and takes the development to the next level with the help of Xcode for MAC OS X. 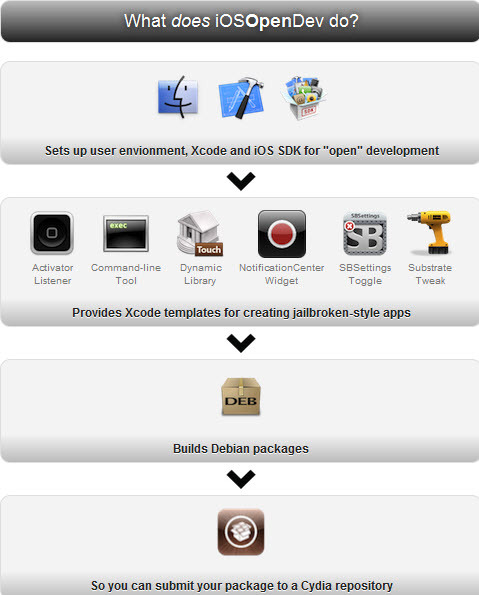 This tool simply allows you to make Tweaks for Cydia using Xcode and this tool. These is really a great opportunity for all those who want to do something in their life and want to be named as one of the top Tweak makers in Cydia. iOSOpenDev is an open platform for all the developers who want to do some development for the Jailbreak world and got a very little experience with development or they are already existing developers and working for some organization or making Apps for fun. The developers of this tool says that this is the first public release of iOSOpenDev, so expect some bugs and consider it as a Beta yet. If you come across any bugs or problems, feel free to contact the developer at dev@iosopendev.com. You can also take a custom screen shot of the problem and email the developer. If you are a new user, so you will have to wait for the how to videos to be released by the Developer later on. If you know about development, know how to use Xcode and combine the packages, so just download this iOSOpenDev and start your work. Before you proceed on, below is some useful information for you. Installer’s “Dependency Tools” option will no longer try to install dpkg (and MacPorts if needed). This was causing too many problems for end-users. The MacPorts and dpkg installations were failing too often. Installer’s “Set up latest iOS SDK” option will (intentionally) fail if dpkg-deb is not found. Installer’s “Dump SDK Header Files” option is not selected by default. End-users were experiencing high processing time for this option and dumping of header files can be done with the iosod tool anyways. Added an “Import Information” message in the installer in hopes it’s actually read! Added missing quotes around variables in iosod tool in hopes to resolve an issue when a project has a space in its path. “Unsetting” language in all scripts, which may be the cause of a possible grep issue. And enjoy the next level of Development. If you like the hard work behind this tool and find this tool a useful, so take your time and consider donating the developer by visiting his website and support him for future improvements.